Does anyone here use hulu or netflicks instead of cable? I just watched one of the Worst documentaries on NF. Well, I scanned past quite a bit. Tony Robbins: I'm Not Your Guru. What a shyster this guy is. It's hard to believe there are so many gullible people out there. It's every stupid corporate "Let's Get Excited" meeting you were ever forced to go to, but 2500 people pay $5K a head to be there. When he get's someone from the audience on the hook, and they're telling their tale of woe, his sound people actually start playing soft music, to encourage others to start dabbing their eyes, clutching a strangers hand, while Tony uses clever phrases like "F*ck that", "That's F*cking Bullsh!t" or "You feel your life is F*cked up, right?" Of course that's so they will be shocked out of their despondence. I can kinda see this. Sometimes I'm in the mood for a scary movie, like devils, monsters and such. I'll look through the horror movies and almost all of them get 1 or 2 stars. Some of them are obviously pretty good, for what they are. heh. I seldom watch something twice. If I do it's usually because I'm with someone else and they haven't seen it, and I've recommended it as good. An aside...Wally uses another sign in on our account. Glad he does because our tastes so different. He once complained to me that "there's nothing to watch"
I asked him if he was rating the shows when they were over, and he said he couldn't be bothered. Have haranguing about it a few times, within a few weeks he started saying things like "Harumph...looks like they're putting better stuff on my board." We sill have cable but we probably watch more movies on Netflix than anything else. 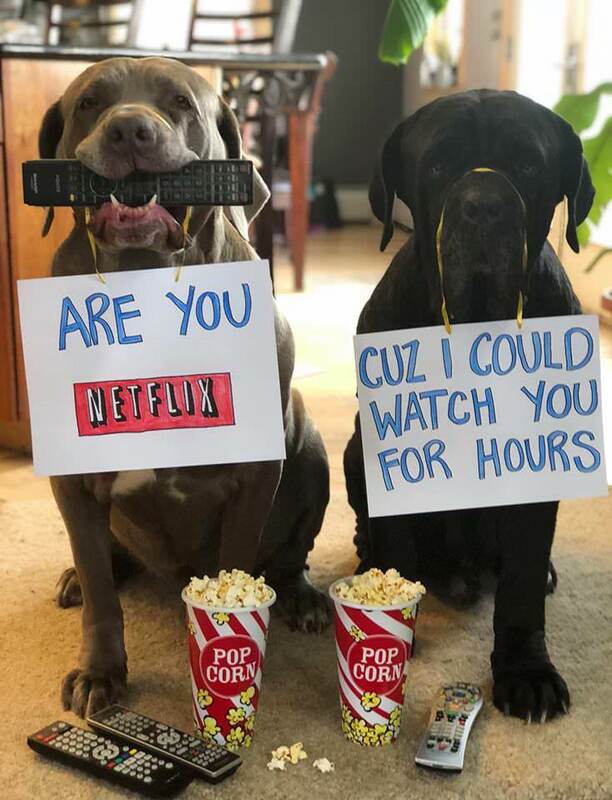 Have you ever checked out Netflix Kids? There's some good stuff on there. LOL I'm sure you're awful. But wouldn't the trolls just all give it a thumbs down? I watched the Leather Special the other night. I agree some people don't like it that a woman is saying words only men are supposed to get away with. Not only that, but Amy has the gall to not only say those words but do it while standing there looking like a totally normal size woman. One who apparently has no shame because she obviously feels good about herself. How dare she? I didn't care for some of it, but it had nothing to do with the subject matter. Other parts were good, and funny. I gave it 4 stars because I look at it that this is an individual doing their job and standing up there all alone, taking it all on themselves. That gets a star added on right there unless they were truly horrible. I've never quite understood why men and women are supposed to be limited to what they are allowed to say or do while the other gender can get away with it. Seems to me, people should be allowed to say whatever the want to and after that I can like or not. That's not the problem. Misogyny is the problem that leads some morons to create spambots to create new ways to thumb down YouTube votes that break record the site's voting records against a particular artist as in the case of Amy Schumer. In her case, not because her comedy was considered bad or terrible but because she had taken to announce her political views nationally (progun control) with her cousin, Senator Chuck Schumer. The people being questioned here were rigging the ratings systems on Netflix with fake accounts. That's not legitimately airing out your opinion and grievance against a person's work or the person herself. Not only is the Hulu app for Apple TV a steaming pile of ****, the "My Stuff" section and your "Watchlist" when viewed through a browser are not in sync. That's impressively horrible. » Does anyone here use hulu or netflicks instead of cable?